The Valley of flowers in Uttarakhand is one of the rarest natural wonders; how else would you even think of a valley full of flowers. The flowers cover all the ground and they bloom everywhere in different colors. It is just like a beautiful painting and you just feel like you have become a part of it. You can spot around 300 species of flora here. The valley has a huge number of rare and endangered flower species. Some of the rare medicinal plants can also be found here. People say that the floral composition of the valley does not remain constant and keeps changing every few days. But, nothing is confirmed about this as being a difficult trek, no one would be inclined to trek upto the valley to click images every day and then compare. You may also spot animals like Tahr, Serow, Goral, Musk deer, Bharal and the Blue Sheep. Valley of Flowers is around 10 km in length, 2 km wide and looks like concave in shape. Along the length, the valley is divided by a river called Pushpawati. There are several tiny streams and waterfalls that rush down from the glacial deposits. River Pushpawati joins another river called Laxman Ganga which flows from Hemkund Sahib. 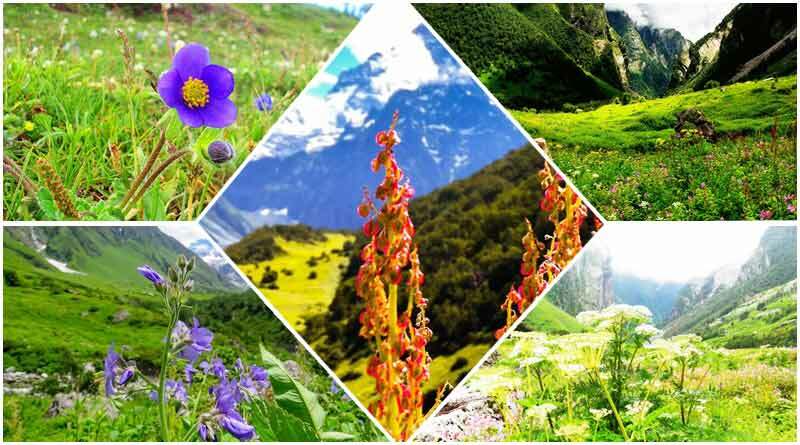 The Valley of Flowers has a pleasant climate and the best time to be here is between July to September because in the monsoons the flowers are in full bloom and you would love to see the floral splendor, especially the Pink Primula. During winters the place is covered in snow and you won’t be able to visit the valley. There are also chances that the roads might get blocked because of snow and/or landslides making the place out of your reach. It requires trekking for about 17kms. The nearest major town to the Valley of Flowers is Joshimath in Garhwal, which has convenient road connections from Haridwar and Dehradun. If you’re travelling from Delhi, you can take the train to Haridwar and then travel to Govindghat by bus or you can simply drive your way from Delhi to Govindghat which is around 500kms. Govindghat is a place close to Joshimath from where the trekking begins. There are also shared taxis that help you travel a distance up to 4 kms and then your trek becomes lesser. People also hire porters, mules and helicopters to reach till Ghangaria. From Govindghat you start trekking to Ghangaria which is located about 3 kms from the valley. After you reach Ghangaria you need to get a permit from the Forest Department to visit the Valley of Flowers. This permit is valid for 3 days only because it is prohibited to visit the valley at night hours. No one is allowed to stay there overnight. Accommodations can be availed at Ghangaria itself.